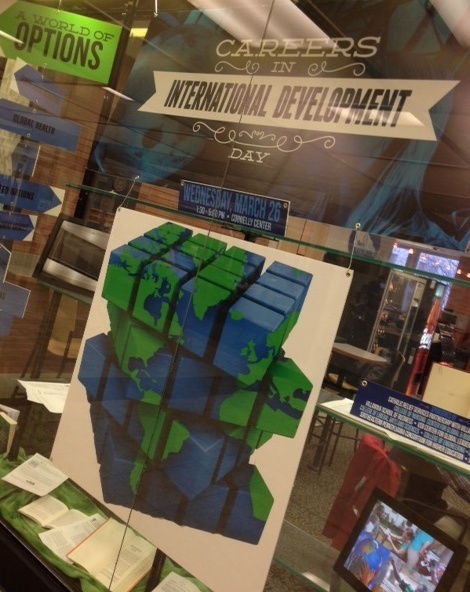 This colorful blue and green window display with its large centrally located sign and eye-catching world map made of four layers of stacked cubes promotes Careers in International Development Day on Wednesday, March 26, 1:30 – 5:00 p.m. in the Connelly Center. Flanking the dominant central elements are two side panels: “World Options” and “Find Out How to Get There.” “World Options,” to the left, lists career choices, such as humanitarian engineering, advocacy, the United Nations and more. “Find Out How to Get There,” the right panel, provides information needed for attending the Careers in International Development Day event. PowerPoint presentations, prepared by Trudy Pacella, staff member of the Office for Mission and Ministry and administrative assistant of the Catholic Relief Services (CRS) advisory board, show photographs from trips taken by nursing students and also from participants in the Careers in International Development Day programs. A panel to the right of the map lists numerous sponsors, among them Catholic Relief Services Partnership with Villanova University and Falvey Memorial Library. 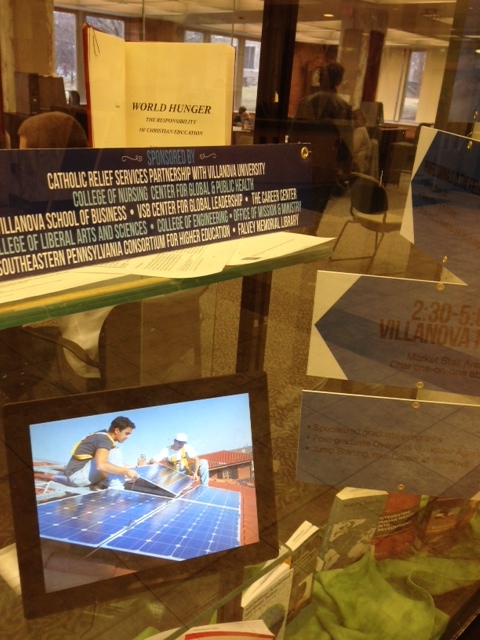 Publications related to international development and written by Villanova faculty, selected by Linda Hauck, business librarian, complete the bottom of the display. Joanne Quinn, design specialist, created and mounted the exhibit. Suzanne Toton, EdD, associate professor, Dept. of Theology and Religious Studies, and coordinator of the CRS Partnership, and Trudy Pacella, senior administrative assistant, provided information and inspiration for the exhibit. 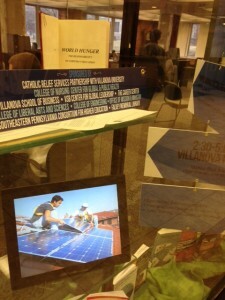 This Careers in International Development Day window will be on display until early April. Photos by Luisa Cywinski, editorial coordinator on the Communication and Service Promotion team and Access Services team leader.